Therapeutic options for central nervous system (CNS) disorders are limited for many patients. Therapeutic delivery to the brain faces many barriers to achieving sufficient drug concentrations at the diseased site while minimizing side effects and toxicity. 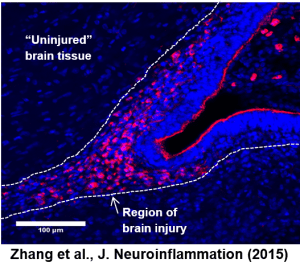 Therapeutic platforms must overcome the blood-brain barrier (BBB), then penetrate into the tissue to reach the diseased cells often associated with many CNS diseases. Nanotechnology has emerged as an exciting and promising new means of treating neurological disease, with the potential to fundamentally change the way we approach CNS-targeted therapeutics. Nanotechnologies can be engineered to cross the BBB, diffuse within the brain tissue, target specific cell or signaling systems, and act as vehicles for delivering therapeutics. The wide variety of available nanotechnologies allows the selection of a nanoscale material with the characteristics best suited to an individual CNS disorder. We have developed both polymeric nanoparticles and dendrimer-based nanoparticle platforms that have both shown promise for application in CNS diseases. Mastorakos P, Song E, Zhang C, Berry S, Park HW, Kim YE, Park JS, Lee S, Suk JS, Hanes J. (2016) Biodegradable DNA nanoparticles that provide widespread gene delivery in the brain. Small. 12(5):678-85. A dense poly(ethylene glycol) coating improves penetration of large polymeric nanoparticles within brain tissue, Sci Transl Med, 4 (149):149ra119. Kannan S, Dai H, Navath RS, Balakrishnan B, Jyoti A, Janisse J, Romero R, Kannan RM. (2012) Dendrimer-based postnatal therapy for neuroinflammation and cerebral palsy in a rabbit model, Sci Transl Med, 4:130-46. Nance E, Timbie K, Miller GW, Song J, Louttit C, Burke C, Klibanov AL, Shih T-Y, Swaminathan G, Tamargo RJ, Woodworth GF, Hanes J, Price R. (2014) Non-invasive delivery of stealth, brain-penetrating nanoparticles across the blood-brain barrier using MRI-guided focused ultrasound, J Control Release, 189:123-32.